One of the Gold Coast’s latest beachside apartment developments, The Beach Apartments Broadbeach, has sold over $20 million in apartments within the first month of its release before Christmas last year. The beachside apartment building will feature a variety of facilities including a podium level outdoor pool and barbeque, zengarden, resident’s lounge, gymnasium and ground floor retail. Colliers International Director of Projects, Tony Holland says that the apartments have a strong pent-up demand from an array of buyers seeking a quality new beachside apartment in an area poised for growth. 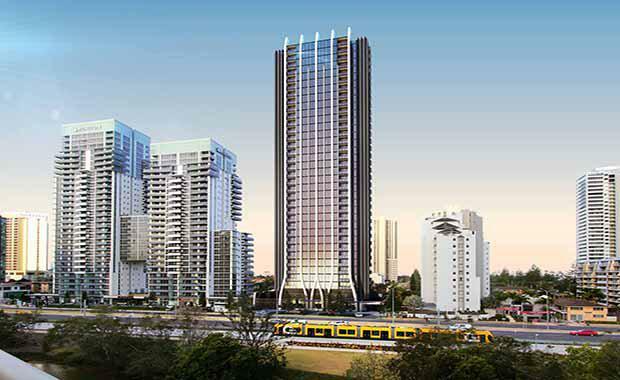 “Broadbeach is the Gold Coast’s premier apartment market – given the suburb’s proximity to the beach, the new light rail network, and surrounding lifestyle amenities. “Residents will have access to the Oracle boutique shopping and dining precinct, Jupiter’s Hotel and Pacific Fair shopping centre, which is undergoing a $670 million redevelopment all within walking distance.” Mr Holland said. Mr Holland believes that the competitive price point and the range of apartment styles mean The Beach Apartments Broadbeach is offering an advantage over surrounding properties. “There are very few new residential apartments being marketed in the sub $400,000 category on the Gold Coast right now. “With vacancy rates at 1.4 percent, rents already strong in Broadbeach, and the appeal of the central location, the Beach Apartments represents a rare investment opportunity.” Mr Holland said. Anthony Moreton Group and Pryde Group with Brookfield Multiplex are developing the property as development managers and builders. CEO of Anthony Moreton Group, Tony Hazell says that local Gold Coast residents looking to downsize and enjoy the Broadbeach lifestyle have been attracted to the two year settlement timeframe as it gives them time to plan their next move. “The Beach Apartments is hitting the market at the right time in the right location. “Our buyers recognize that the market is now in an upward cycle and have strong expectations that by the time they are required to settle in early 2017, the value of new property will have improved significantly from where we are today.” Mr Hazell said.